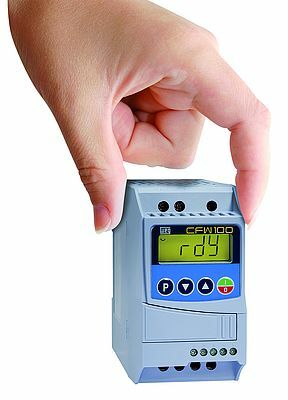 WEG has added the CFW100 mini frequency inverter to its line of frequency inverters. This compact inverter is available in three sizes (A, B and C) for rated motor power from 0,18 to 0,75 kW and rated current from 1.6 to 4.2 A. With a height of 100 to 126 mm, a width of 55 mm and a depth of 129 mm, the units are among the smallest frequency inverters currently available offering many applications at the user's fingertips. The mini frequency inverters with integrated micro-PLC are particularly suited to simple technical applications in the commercial and consumer sector, such as swimming pool pumps, motorised hospital beds, lift doors and fitness equipment, as well as small fans or mixing machines and special-purpose machines. With its combination of extensive functionality and small size, the inverter is easy to integrate into electrical cabinets and machines. This gives users an especially compact and cost-effective solution for controlling the speed of three-phase induction motors. Along with the integrated micro-PLC, which supports IEC 61131-3 compatible programming, the device features an intuitive human-machine interface (HMI) with an LCD display. The plug-and-play design of the new frequency inverter makes installation and commissioning especially easy.